Wheatgrass is a nutrient-packed member of the cereal grass family, which includes rye, barley and oats. 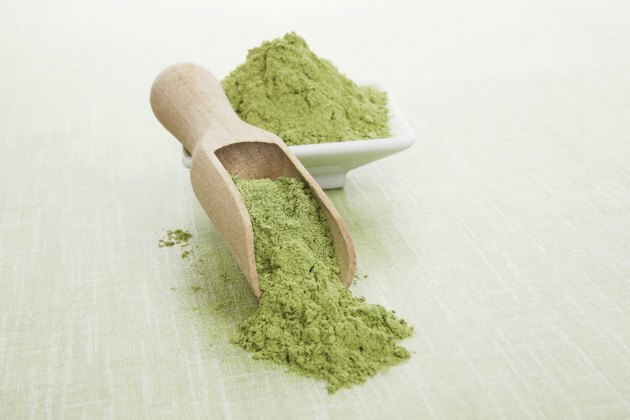 Wheatgrass powder is made by freeze-drying, oven-drying or air-drying fresh wheatgrass. Adding wheatgrass to your diet is an effective way to get your quota of five to nine servings of fruits and vegetables a day, according to Illinois State University. Although the use of wheat grass for health and healing can be traced to ancient Egypt, Western world consumption began in the 1930s as a result of Charles F. Schnabel's work. His experiments with nursing dying chickens back to healthy, highly productive states -- using fresh wheatgrass -- encouraged him to begin drying and powdering wheatgrass as a dietary supplement for family and neighbors. Thus began the development of wheatgrass powder -- a convenient and effective way to get the powerful benefits of fresh grass. Many people experience painful digestive disorders. Wheatgrass is linked to improved digestive system function and constipation prevention. It's also used as treatment for irritable bowel syndrome and acid reflux disease, according to UCLA Brain Research Institute. An article published in "Scandinavian Journal of Gastroenterology" in April 2002 noted that wheatgrass appears to be safe and effective as a treatment for certain gastrointestinal conditions. Wheatgrass is a source of chlorophyll, a potent health agent, according to Columbia University. Positive effects of chlorophyllin -- a component of chlorophyll -- include protecting against liver cancer, reducing damage from cancer-causing substances and combating colon cancer. Wheatgrass is 70 percent chlorophyll. An article published in "Cancer Epidemiology, Biomarkers and Prevention" in April 2006 noted that the data from a study done on colorectal cancer suggested that consuming more chlorophyll-containing greens, while reducing red meat intake, may reduce the risk of colon cancer. Antioxidants are substances that help protect your body from free radicals -- unstable molecules that damage healthy cells. Wheatgrass contains vitamins A, C and E -- all potent antioxidants. An article published in "International Journal of Food Sciences and Nutrition" in September 2012 revealed that a study conducted to determine the effects of freeze-dried and hot-air dried wheatgrass on antioxidant properties showed freeze-dried wheatgrass provided higher antioxidant value than fresh wheatgrass.